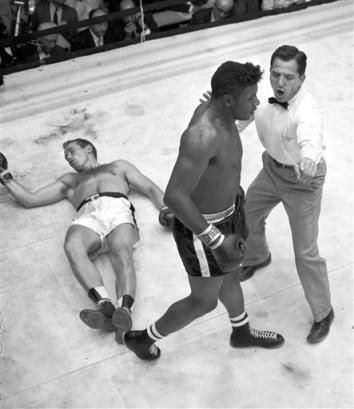 In the 1950s, professional boxing was one of Americans’ favorite televised sports. Gillette sponsored Friday Night Fights, especially popular among hardworking men and women after putting in a five-day week. In the coal mining community of Midway, West Virginia, my father allowed his three sons to join the fun. My mother and two sisters generally avoided the entertainment. So, I guess that explains the events of one Appalachian summer Saturday morning. My father usually worked overtime at the Slab Fork coal mines on Saturdays, but either there was too little work that Saturday or he just decided to take a well-deserved holiday. I grew up in a modest four-room home, but the house had porches on the front and rear. The front porch stretched the width of the white clapboard house and afforded a wonderful spot for catching the mountain breezes. This particular Saturday morning, my father’s cousin, Page, visited us. My father and Page had been good friends since their teenage years. My father and Page sat on the porch, smoking cigarettes, drinking coffee, and talking about God only knows what. Ralph, six years old, and I, older by 17 months, were at the other end of the porch minding our own business. Child-size boxing gloves. You’ve got to be kidding. He must have been planning this for months. It wasn’t enough entertainment to watch two adult men standing toe-to-toe, beating each other’s brains out. Let’s have some real fun and watch two young boys have at it. I was game. After all, I had watched the professionals box. I could certainly bob and weave as well as any of those old men. Besides, I had spent much of my youth making life miserable for Ralph. When he was an infant, my mother put me in charge of swinging him in the baby swing in the backyard while she did housework. I swung him all right — I swung him harder and harder until the swing fell over. Reasoning (Do toddlers reason?) that I could no longer swing him since both the baby and the swing now lay on the ground, I ran off to play with my friends. I got a switching for that, but the punishment didn’t take. Heck, during a snowstorm just last winter, I had put Ralph in a metal tub on the sidewalk and filled the tub with water. Yes, I got a switching for that, too. And now, at his cousin’s provocation, my father laced up my boxing gloves while Page did the same for my brother Ralph. After all the terrible things I had done to my brother, my father now gave me permission to beat the stuffing out of Ralph. I stood there in my best Floyd Patterson or Archie Moore pose, ready to inflict one more injury on my brother, this time with the assurance that no switching would follow. I remember what happened next like it was yesterday. Just like Ralphie in the Christmas movie, my brother had had enough. I could pose like a boxer, but, unlike his older brother, Ralph could throw a punch. And I couldn’t do anything to defend myself. He backed me into the porch railing and threw punch after punch until my father pulled him off me. That’s the day I learned to respect my younger brother. We got into other fights over the years, when we resolved any dispute with a wrestling match. He won some. I won some. But I never challenged him to a fistfight. Once was enough. I never forgot Boxing Day.